Our annual Mock Interview Day was held on Tuesday, November 7th from 3:00pm – 6:00pm in Watson Auditorium. The day consisted of four rounds of 45 minute interviews conducted by 57 employer volunteers from multiple companies across industries. In total, 128 students participated in 216 interviews, providing two practice interviews on average per student. 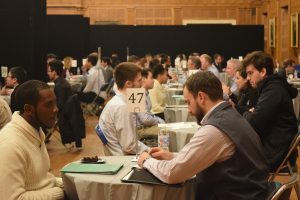 Many of the employers will be inviting students back for formal interviews. -Sending a thank you email to the employers with whom you spoke. Find our guide to thank you notes here. -Unable to send a thank-you note for lack of contact information? Stay connected with social media: find the company or even the person you spoke with on LinkedIn or Twitter. Follow their feeds to stay up to date with new openings and other news! If you were unable to attend Mock Interview Day, be on the lookout for future opportunities to engage with employers and don’t miss the spring CO-OP + CAREER Fair on March 20th, 2018. Check The Fairs App as we get closer to the Spring Fair for updates on employers attending. Employers, invitations for the spring CO-OP + CAREER Fair on March 20th will be sent out in the new year. Thank you to all students and employers who joined on November 7th to conduct practice interviews. We look forward to seeing everyone in the spring!